Today I'd like to share another of my favourite, blog writing, wedding photographers with you. Roger Overall has written a three part blog posting entitled The Art of Documentary Wedding Photography and it has really helped me to explain and understand my own style. I only discovered this blog in the last week as another of my blogs referred to it. You can find the blog posting here, with easy links to parts 2 and 3. Some of the points made that really resonate with me are as follows. Roger talks about how he respects the wedding day as just that, not a look at the photographer day! He is setting out to preserve the facts of the day not direct them. I feel strongly about this too and some of the methods he describes are exactly what I find myself doing. It's just little things like if you're photographing during the ceremony and need to move you don't do it until there is some movement in what is going on, for example a reader getting up, so that you don't distract from what is going on. I have been doing this without thinking about it because it just feels right but it was reassuring to see it highlighted. Roger talks about one of the main skills being anticipation. This is where my years of people watching come in! If you can predict what someone is going to do, you can be there to photograph the moment, with chance to position yourself for the shot you want. In addition to this all weddings follow certain patterns so the more experience I get, the better I'm getting at being there to capture that moment. I love Roger's little side comment about number of pictures. I completely agree that some weddings can be fully captured with 150-200 images. I don't want to feel pressured to create 1000 images and those photographers that are creating this many are the ones interfering with the day, every new directed pose is a new image. I am taking what happens and presenting to you the best of those moments. It was a real relief for me to read this! The points on post production are similar to my views, I call myself a 'bit of a purist' but that does mean you can't crop or turn something black and white. On top of this I also have my 'specials' because I love playing with new styles. But they do date, the majority of my images will be simple. I was very pleased to read that Roger does do these, because you can't avoid it, the expectation on a wedding day in England is huge! However he and I are perfecting the method for getting them done super fast! This requires knowing exactly what you're doing and where in advance, I will always request this information and plan it on the venue recce. For me though, in addition to groups, outside of the 'documentary' style my preference is to have 30 minutes to get some bride and groom portraits done. And the reason I am confident to keep this in my style is the number of times I've been told that the bride and groom really appreciated the break, and the chance to catch up with each other. That and a chance to get some great images of course. I got a great boost from finding someone whose views about wedding photography match mine but then I looked back over my last few weddings and saw that my final results don't demonstrate the style I feel most passionate about. No I don't like to get in the way, but recently I've felt I've had to, to get the shots I want. 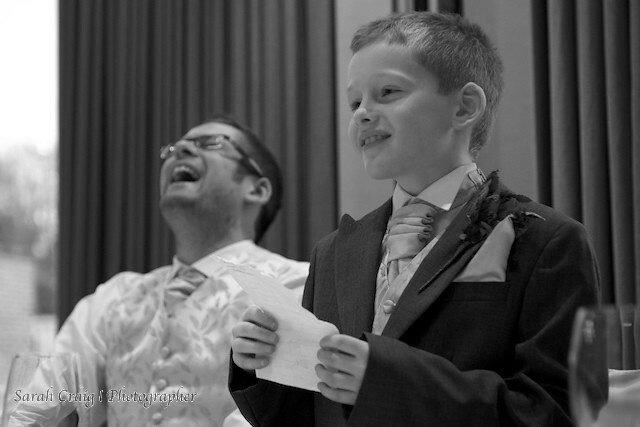 The picture I included at the top of this posting is a good documentary image of mine because it was a special and unique moment with an 8 year old delivering a speech and his Dad, the groom, showing such lovely laughter next to him. But speeches are a given. I am taking a lot from what I have read to move my style forward. So that was this week's Favourite Photo. Love that photo at the top! The majority of your photographed weddings seem to be friends where you'd be a guest, as well as a photographer. Do you ever find yourself just wanting to be the guest, instead of watching through a lens? Also, do you have any suggestions for starting to learn about the very basics of photography i.e. moving from just snapshots?! Yes, this year i'm only getting to be a guest once, it's in two weeks and I'm really looking forward to it! But I love photographing for friends because it's such an intense time. I won't forget catching Bex's eye during the ceremony the other week and exchanging a smile, only me and the Vicar get to be in front of the bride and groom. However it's much harder work when I'm really close friends, I try to be in too many places, and frames of mind at once, thankfully most of them are married now and my portfolio is getting me more strangers. Honestly I think everyone's 'basics' of photography are different. I think you need know what you want to photograph and then expand on the relevant skills. I'm still really bad at landscapes, and although I have to do some still life with weddings, it's not my passion, I just want to photograph people. When I knew that, my basics became figuring out when things happen, where a good place to stand is and therefore lens lengths. This stuff is more important to me than the technical. I shoot pretty much everything on a high ISO and shutter priority to ensure sharpness. But other passions require other skills. There's nothing wrong with a snapshot if something's happening in front of you that you want to document but if you've got a second to look past your camera at what it is specially you're interested in, in front of you, and where might be the best place to capture that you'll probably start to notice an area of interest in your pictures, and a style. Always review what you've taken and critique yourself. Clearly this could be a blog posting of it's own right!